Presentation – The first thing you’ll notice when you start playing Skulls of the Shogun is its fantastic visuals. The cel-shaded art and bold colors are striking together, and the cartoony style makes the game seem more accessible than your average straight-laced strategy affair. Coupled with the cool, laid back, samurai hip-hop soundtrack (think Gorrilaz mixed with RZA’s Kill Bill soundtrack), the visuals make for an instantly likeable and memorable game. Each level of the campaign is spread across four areas based on the four seasons, making for beautiful battles with the undead. The game is also laugh-out-loud funny at times, with much of the humor stemming from General Akamoto’s pompousness and his subordinates lack of proper respect, which serves to break up the tension that can accompany the tactical gameplay. 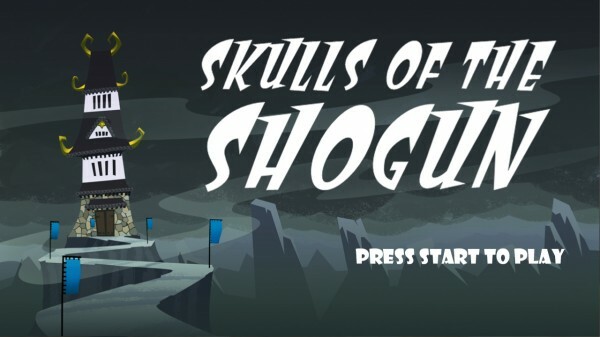 Gameplay – Those worried that Skulls of the Shogun may be tactic-lite given its console release and the fact that it’s cute (well, it is!) can rest assured that there’s plenty of depth to the game. It’s not an easy ride either, as your troop will be vastly outnumbered at the start of most levels. While extra recruits and spell-casting monks can be summoned by haunting the appropriate shrine, reaching shrines is not always easy, and these extra troops and spells come at a price in the form of rice, meaning some good resource management is required. Soldiers can be upgraded to demons by having them eat the skulls of dead enemies, providing extra health and extra turns, but again this is easier said than done. Not only that but whenever you can earn summons or upgrades, so too can your opponent. Players can also use General Akamoto himself in battle, and he seems a good choice given his strength, but if the general dies then it’s game over, man. So it’s often better to leave him sleeping (sorry, mediating) since he increases his health while in this state. No grid – One thing that strategy fans will notice is that there is no grid on the maps; instead, units can move within a circle. The radius of the movement circle changes depending on which type of unit you are using, and the circle of movement is reduced following an action, so players need to be careful not to leave their warrior exposed. Some attacks also come with a cool knock-back mechanic: attacking at the right angle can sometimes knock enemies off cliff edges. Of course enemies can use knock-back too, but you can protect yourself by forming a “spirit wall”, which basically encompasses standing really close together. Skulls Anywhere – Skulls Anywhere is the asynchronous multiplayer mode that we’ve been hearing about. 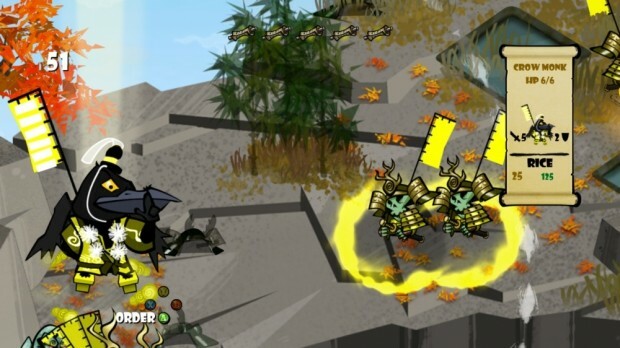 It’s the first of its kind on XBLA and works a bit like a game of postal chess. Once a match has been created players make their initial move then upload it for the next person to respond. You can then continue to play other matches or modes in the game or just quit out and go about your daily business. When your opponent takes their turn you are alerted with an in-game popup or on the menu screen the next time you launch the game. The asynchronous mode works across XBLA, Surface tablets, Windows 8 phones and Windows 8 PCs, but we were only able to test out XBLA to XBLA during for our review. Nevertheless, it was an excellent feature that will likely extend the life of the game’s multiplayer community, and we found having several asynchronous matches on the go to be quite addictive. Early Difficulty Spikes – The game starts nice and gently with the first few levels showing players how to attack, gather resources and how to summon monks — just as it should be. Then, without warning, you’re dead. It’s not that we’re criticizing the difficultly, though the game is surprisingly difficult even on normal, but rather the suddenness and steepness of the jump. Once you eventually make it past the first hump the difficulty continues to increase but a little more gradually, perhaps because you’ve became a better player. However, that first spike could result in a few broken controllers and rage quits early on. Bugs of the Shogun – One of the few black marks against Skulls of the Shogun was the bugs we encountered. There were several instances where soldiers got stuck in places and unable to move. Though this was able to be resolved by returning to the last checkpoint, a couple of more serious issues were found when one round started with no one able to move and pushing the guide button and going back to the dashboard was the only solution. There was also an incident where the game completely crashed back to the dashboard with a scary error message being displayed on screen. Lag and tear – Along with the bugs we also experienced frequent lagging and screen tearing towards the latter levels of the single-player campaign. Whilst there was nothing game-breaking and the major issues were in the minority, they can be frustrating, especially when you’re 30 minutes into a level and have forgotten to manually save. Hopefully a title update will solve most of these issues, but it’s sad to see in a game so highly polished. 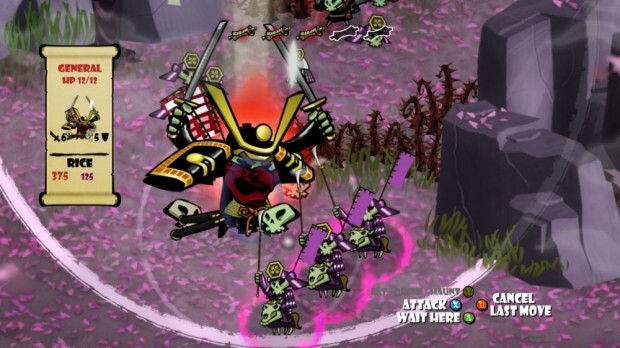 Despite a few frustrating moments with some rogue bugs, Skulls of the Shogun is a great game. 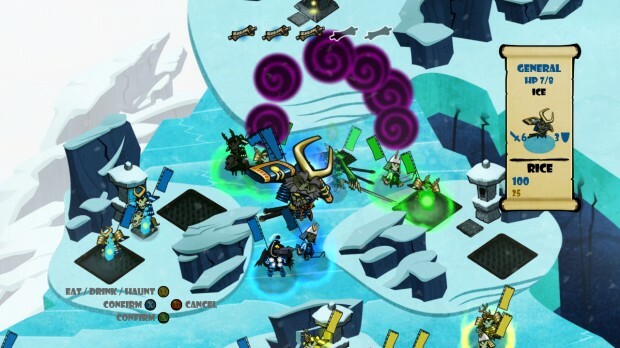 Its playful graphics may lull you into thinking this is a strategy game for beginners, but Skulls is far from a shallow outing. With 20 challenging campaign levels across four stunning areas, there’s more than enough single-player to warrant the 1200 MSP price tag. On top of that, the inspired asynchronous mode will surely keep the multiplayer community alive long after the inevitable “next big thing” lures away the masses.